GarryB wrote: Personally I think the Russians should build a few oil refineries and produce their own fuel and stop exporting crude, and in gas they should develop and produce liquid natural gas and deliver it by super tanker... the profit margins on refined fuels like LNG and petrol are much higher than for the raw gas and crude oil. I think thats not a bad idea to value add over raw materials ,but for countries that border russia and where demand is high and transporting gas/oil over pipeline is much cheaper then transporting it via ships then there is no harm in building pipelines. For countries where is not feseable like India they do deliver it via tankers etc. Value addition is a good idea they should build refineries and develop products. Certainly pipelines to places that appreciate it and don't whine makes sense, but for most of Europe I think Pipelines are not worth the effort taken to secure and maintain. Having a tanker fleet also means a global supply potential rather than the current system limited by permissions to lay pipe. Saudi Arabia and Russia both want the same thing, top dollar per barrel of crude. Neither will slash prices. It would be in their interest to keep increasing prices...what would anyone else in the world do? Dump their oil cheaper?.....won't happen. Russian President Medvedev inaugurated the construction of the controversial undersea natural gas pipeline system Nord Stream on 9 April 2010. 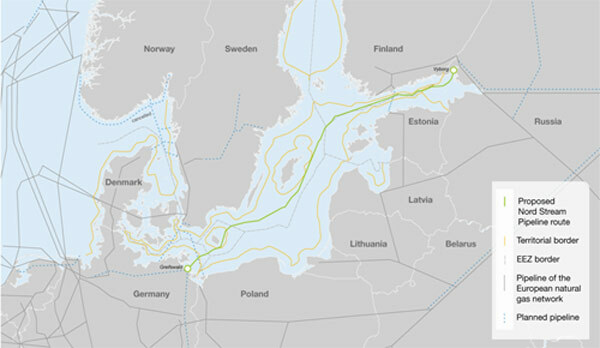 The geo-political importance of Nord Stream cannot be overestimated. With the construction of the pipeline, Europe and Russia will be tied to each other even more closely. Russia will get a direct link with Western Europe without transit through Eastern Europe. Russia already meets a quarter of Europe’s energy needs. Nord Stream will increase European dependence on Russian natural gas further. Russia presently supplies about 140 billion cubic metre (bcm) of gas every year to Europe. Nord Stream will add up to 55 bcm per year to this capacity. The gas will be supplied via two parallel steel pipelines of 27.5 bcm/year capacity each. The length of this under sea pipeline is 1220 km. It will begin at Vyborg in Russia near St. Petersburg, cut across the Baltic Sea (maximum depth 210 metres) and reach Greifswald in Germany. It will cost about US $12 billion to build and will be ready to deliver gas by 2012. It will be the largest underwater gas pipeline system when built. The pipeline will pass through the territorial waters and/or economic zones of Russia, Finland, Sweden, Denmark and Germany. Several side pipelines will be built in different countries to connect with the main pipeline. The pipeline, discussions about which began in 1997, is an outcome of the strong commitment from former German Chancellor Gerhard Schroder and Vladmir Putin, the former President and current Prime Minister of Russia. Schroeder is presently the chairperson of the Shareholders’ Committee. The strongest objection for the pipeline has come from Poland. In 2006, the Polish defence minister compared the agreement between Russia and Germany with the 1939 Nazi-Soviet Pact. There have also been apprehensions that the pipeline may be misused by Russia for spying purposes. Russia has dismissed these allegations as unfounded. Countries like Ukraine, Poland and Belarus stand to lose US $1 billion per year in transit fees when the pipeline is constructed. Thirty per cent of the funding for the project will be provided from the equity holdings while the rest will be raised by various banks. Several European banks have joined the project to raise funds. Nord Stream is a truly pan-European project in which a large number of companies are joining hands. Russia’s Gazprom holds 51 per cent of shares in Nord Stream AG, Germany’s Wintershall and E.ON Ruhrgas hold 20 per cent each, and the Netherlands’ Gasunie holds 9 per cent. These companies have wide experience in building and operating natural gas pipeline projects around the world. Some other companies are expected to join the project. The equity holding pattern will change in future as more companies join the project. Already funding to the tune of US $4 billion has been raised from 22 banks. The project will supply Russian gas to Germany, France, Denmank, Belgium and the Netherlands. Eventually a pipeline may be built to connect the United Kingdom also. The pipeline will help Russia diversify its routes and Russia’s dependence upon Ukraine for supply of gas to Europe will reduce. The recipient countries will be freed from supply disruptions caused by Russian-Ukrainian spats in the last few years. This factor alone has compelled Germany to back the pipeline project. Nord Stream will get its gas supples from Yuzhno-Russkoye gas field which has an proven gas reserves of 700 bcm and estimated reserves of one trillion bcm. The fields in the Yamal peninsula, Ob-Taz bay and Shtokman gas fields will also be added. These are some of Russia’s largest gas fields. The project will change the nature of Russian-European relations. It is hoped that energy interdependence will forge better ties between the EU and Russia. Nord Stream is crucial for Europe’s energy security. Europe currently needs about 543 bcm of gas annually. This will go up to 629 bcm by 2025. Eighty one percent of this will have to be imported. Nord Stream will meet about 25 per cent of the projected growth in Europe’s gas imports. No wonder the project is listed as a priority project in EU’s Trans-Europe Energy Network (TEN - E). Despite the beginning of the construction of the pipeline environmental concerns remain. The Baltic Sea is considered to be one of the most polluted seas in the world. Chemical and conventional munitions were dumped into the Baltic Sea after the two world wars. Several surveys have been carried out in the past to map the sites where such munitions may be lying. The pipeline route seeks to avoid sensitive sites. The concern is that construction activities in the sea may stir up the toxic waste in the Baltic Sea. Russia has said that the environmental impact studies done for the Nord Stream show that the pipeline is safe. Finland would not allow any construction ships to anchor in its economic zone. The pipeline project has obtained safety and environmental clearances from the concerned countries and agencies but environmental NGOs like WWF have criticised the environmental impact clearances obtained as inadequate. Doubts have also been expressed about the economic viability of the project. Will it deliver Russian gas to European customers at an affordable price? Despite these apprehensions, Nord Stream should come as a great relief to energy starved Europe. Europe is looking for alternative non-Russian sources of energy supply as well. The Nabucco project is one such project aimed at delivering gas from Central Asia to Europe. Russia’s counter to Nabucco project is the South Stream project through the Black Sea into Southern Europe. It may be noted that together Nord Stream and South Stream gas pipelines will equal the gas pipeline capacity of the Russia-Ukraine-Europe system. Russia is no doubt an energy super power. The dependence of individual European countries on Russian gas varies from 21 per cent in the case of France and 43 per cent for Germany to 74 per cent for Austria, 79 per cent for Poland and 100 per cent in the case of Finland. This dependence is likely to continue in the foreseeable future. The Nord Stream Project will further strengthen Prime Minister Putin’s vision of positioning Russia as a major power in the world. * Will meet about 25% of the growth in Europe’s gas import needs between 2005 and 2025. Russia’s largest privately owned oil firm LUKoil has acquired ConocoPhillips’ indirect 30 percent interest in NaryanMarNefteGaz (NMNG) operating in the Timan Pechora oil and gas province in northern Russia, the firm said on Wednesday. “The acquisition brings LUKoil’s total ownership interest in NMNG to 100 percent. Financial terms of the transaction were not disclosed,” LUKoil said in a statement. In view of the sale of ConocoPhillips’ 30 percent stake in NMNG as part of its divesture program for 2012, LUKOIL is aiming to strengthen and consolidate its positions in its key upstream Timan Pechora region, the statement said. ConocoPhillips said it expected to recognize an after-tax financial gain of about $400 million for the sale. "The sale of this non-core quality asset is an important component of our divestiture program for 2012,” said Don Wallette, executive vice president, Commercial, Business Development, and Corporate Planning. “We are pleased that LUKoil, the co-owner of NMNG, recognizes the value of this asset." The sale of NMNG is part of ConocoPhillips’ plan to increase value for shareholders through disciplined capital investment, improved returns on capital and growth in shareholder distributions. Would much rather see developments that result in technologies that allow cleaner use of fossil fuels and then the change to renewable energy sources... but as long as oil is cheap they are not getting the investment and focus they need to develop and mature. GarryB wrote: Would much rather see developments that result in technologies that allow cleaner use of fossil fuels and then the change to renewable energy sources... but as long as oil is cheap they are not getting the investment and focus they need to develop and mature. That being the case , Oil and Gas would still be in demand for the next 50-100 years that is beacause most of the big oil companies have deep pockets to fund politicians , bussiness lobies and governments and it is in their interest to not let alternate fuel take shape. So even though they continue to pay lip service with regards to green fuel it would still be a small percentage of fuel and fossil fuel will continue to dominate. The chief executive of Rosneft will on Thursday finalise a deal with BP that will turn the Russian national champion into the world’s largest publicly traded crude oil producer. Not sure of the deal is good or bad as state run corporation tend to be very bloated and ineffecient. I agree, it should help Venezuela with its oil exploration and production efficiency, but overall I would prefer that the Russians looked and invested more seriously in other energy areas. I rather doubt any one alternative energy can replace oil, but a combination of several different types should enable Russia to export energy technology to allow countries to expand and grow without polluting the planet more. The only energy that is pollution free and has long term energy security is Nuclear Energy. Austin wrote: Not sure of the deal is good or bad as state run corporation tend to be very bloated and ineffecient. Interesting...especially the first 'alarmist' article. Thx. Austin wrote: Is Arctic a Curse in disguise ? Curse my arse...Russia's future IS IN the Arctic. If I had serious money to invest I'd be buying up dirt cheap land in Russia's north. In 15-20 yrs that place will be a gold mine and the place to be. ST. PETERSBURG, January 10 (RIA Novosti) – Russian energy giant Gazprom and Russia’s largest independent gas producer Novatek have signed a deal to jointly produce liquefied natural gas (LNG) on the Yamal Peninsula in the Russian Arctic, the companies said on Thursday. The deal was signed by Gazprom CEO Alexei Miller and Novatek Board Chairman Leonid Mikhelson. Gazprom announced in late December 2012 it planned to create a joint venture with Novatek to develop the Tambei group of gas fields. Gazprom said at the time it planned to get a 75 percent stake in the joint venture while Novatek would hold 25 percent. Miller said on Thursday the venture, which will focus on LNG production for the Asia-Pacific region, would define the parties’ stakes and contributions by August 1 this year and will be established by the end of 2013. The Tambei group of gas fields on Yamal holds 1.56 trillion cubic meters of natural gas and could produce up to 20 million tons of LNG per year. Russia’s Rosneft Company has signed a long-term contract for the supplies of oil to Poland through the “Druzhba” (Friendship) oil pipeline. In compliance with this contract within the three years PKN Orlen will buy oil from Russia to the tune of 15 billion dollars, Russia’s biggest oil company says. The total sum of this contract has been set in the present-day prices. The annual volume of supplies will reach 6 billion tons of oil, and the total volume – 18 million tons. The buyer is Poland’s company PKN Orlen, the owner of the plant in Plotsk. KRASNOYARSK, March 30 (Itar-Tass) – The Russian natural gas flow cannot be reversed from Europe to Ukraine, Gazprom CEO Alexei Miller said on Saturday, March 30. For decades gas was supplies to Ukraine from the east from Russia and Turkmenistan. Recently, Ukraine said it had received gas from the West. Experts think that liquefied gas is transported to Ukraine from European seaports by pipelines via Poland and Slovakia. Speaking of Ukraine’s plans to buy natural gas at spot prices in Europe, Miller stressed that the price of gas there is higher and under long-term contracts with Gazprom. “In this situation Ukraine will not be able to pay the price of gas from Europe,” he added. Commenting on so-called shale gas from the United States, Miller said, “We see no risks there. America is not a competitor for us in this respect. The U.S. still has a shortage of gas. We are not aware of any one project to produce shale gas in the U.S. None of the wells there has a positive value. It’s a bubble that will burst soon,” he said. Ukraine imported 2.494 billion cubic metres of natural gas from Russia and the European Union in January 2013, the national statistics service said on Wednesday, March 20. In January, Ukraine imported 2.448 billion cubic meters of gas from Russia worth of 1 billion 132,700 U.S. dollars. The average price of Russian gas for Ukraine was about 408.63 U.S. dollars per 1,000 cubic metres. Ukraine also bought 46.714 billion cubic metres of gas from Germany to a total amount of 18.219 million U.S. dollars. The average price of gas purchased from Germany was 390 U.S. dollars per 1,000 cubic metres. The largest portion of gas is imported under a contract between Naftogaz Ukrainy and Russian Gazprom signed in 2009. The Cypriot company Ostchem Holding also imports natural gas from Russia to Ukraine. The company is owned by Ukrainian entrepreneur Dmitry Firtash. In 2013, Ostchem Holding can import slightly over 8 billion cubic metres of natural gas from Russia for the enterprises within Ostchem Group. Firtash said earlier that his company was buying natural gas from Russia “at a lower price” than Naftogaz Ukrainy buys from Gazprom. Alexey Miller, CEO of Gazprom, believes that the extraction of shale gas in the US is unprofitable and that the American shale gas industry “is not a competitor” for the Russian energy company. In an interview for the state owned Rossiya 24 TV channel, Miller stressed that “currently, there aren’t any projects that we know of where shale gas production would be profitable”. He also pointed out that the US remains a country with a gas deficit and that the increase in volume of shale gas production corresponds with the dip conventional in natural gas extraction on US territory. Gazprom CEO believes that the development of shale gas production in the US poses “no risks” for the Russian company and that the reason behind the increase in shale gas production is the desire for “energy security”. If Alexey Miller is correct in his view on the shale gas industry, then it can be inferred that for the US government the economic and financial considerations are secondary to the goal of having a reliable energy source on the US territory. Shale gas extraction can help the US get rid of the dependence on the energy delivered from the Middle East, but can’t help the American companies compete with Gazprom on the European market. A number of experts believe that the shale market “revolution” is actually a bubble created on Wall Street in order to fool unsuspecting investors. Alexey Miller shares this view. “We are skeptical about shale gas… this soap bubble will burst soon”, he explained. The opinion expressed by Gazprom CEO is echoed by Vagit Alekperov, President of Lukoil. “Of course, it is a great achievement on the part of US engineers that America is now producing oil and gas from shale. In order to do it, they had to drill very tricky wells and do hydraulic fracturing. Undoubtedly, this is an achievement, but I wouldn’t call it a revolution” he told RT. This view is supported by a number of Western experts. In a recent report published by Bloomberg New Energy Finance, the possibility of a “shale gas revolution” in the UK was described as “wishful thinking”. Despite the successes of the shale gas industry in the US, the future of the European energy market is still dependent on conventional gas producers like Gazprom.